I don’t really get twitter yet but I’ve enjoyed following @lancearmstrong. He’s out training with Thor Hushovd. Following cycling results. Eating pasta and eggs before the MSR. 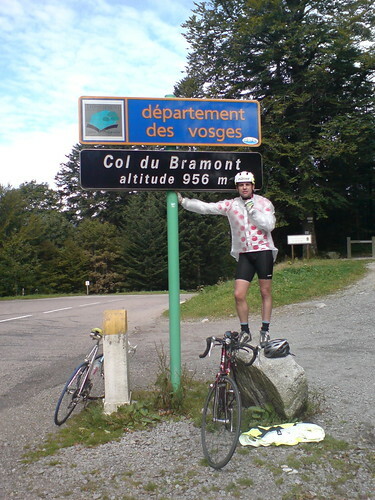 Posting a picture of himself at the top of the Col de la Madone. I haven’t read the book myself but this same laconic style of reporting becomes strangely compelling when read one tweet at a time. How did I feel about the news Armstrong had stepped out of retirement? Hard to say. Can he really do it, at the age of 37? Will his team want him back? Can he ride as a domestique for Contador? The official reason given for his return, that he wants to promote LIVESTRONG.COM, I find hard to believe. It’s not the whole story. Lance Armstrong has never tested positive for drug use and has probably been tested more thoroughly than anyone else. He’s also managed to steer clear of the kind of accident which instantly puts paid to all those long hours of training. Luck plays a part, but so do quick wits and superb bike handling skills. Watch how he avoids a crash to stay on route for victory in 2003. Truly epic! He’s steered clear of injury until recently, that is. Here’s a post-op picture of his shattered collarbone, held together with a plate and pins. I grabbed it from a video on livestrong.com. Not pretty. Whatever you feel about Armstrong, he’s a fighter. This is some set-back, but it won’t mark the end of his TdF ambitions. I think he fancies his chances in the prologue.